The South American rainforest katydid is not a human. In fact, it is so very unlike a human, it seems ridiculous to belabor the point with specifics. Six legs, wings, an exoskeleton. You get the picture. Its ears are on its hind legs, for crying out loud. But oh, those ears will surprise you. Research published in today's issue of Science reveals that the anatomical and functional features of this insect's ears have developed over time to be remarkably similar to yours, mine, your dog's, and those of countless other mammalian species. How's that for evolutionary weirdness? In humans, hearing is made possible by three functionally distinct anatomical structures. The first is your eardrum, which picks up sound waves from your environment. The second is your middle ear, where the waves of pressure generated by your quivering ear drum are converted into mechanical vibrations by a trio of tiny bones called ossicles. These vibrations generate waves through the fluid housed within your cochlea, where sensory hair cells (the third component in the ear's three-part structure) convert them into the electrical impulses that tell your brain you've heard something. The linchpin components in mammalian hearing are the bones of the middle ear (named malleus, incus and stapes, you'll find them in the deliciously retro Encyclopedia Britannic figure featured above). Your ossicles bridge the gap between your ear drum and your cochlea by not only relaying the information packaged in incoming soundwaves, but amplifying it in the traveling waves of your cochlear fluid. [The researchers] show that in the [rainforest katydid], outer-ear tympanal membranes [analogous to our eardrums] are coupled to a stiff, leverlike middle ear–like structure, which is in turn coupled to an elongated, fluid-filled chamber of the inner ear that contains a linear array of sensory receptors (see the figure). The key finding is the impedance matching and amplification step by a leverlike, middle ear–like component, the tympanal plate, which acts in concert with the tympanal membranes that heretofore had not been known to exist. This TM-TP "middle ear" efficiently transfers airborne vibrations into vibrations of the fluid-filled acoustic vesicle. 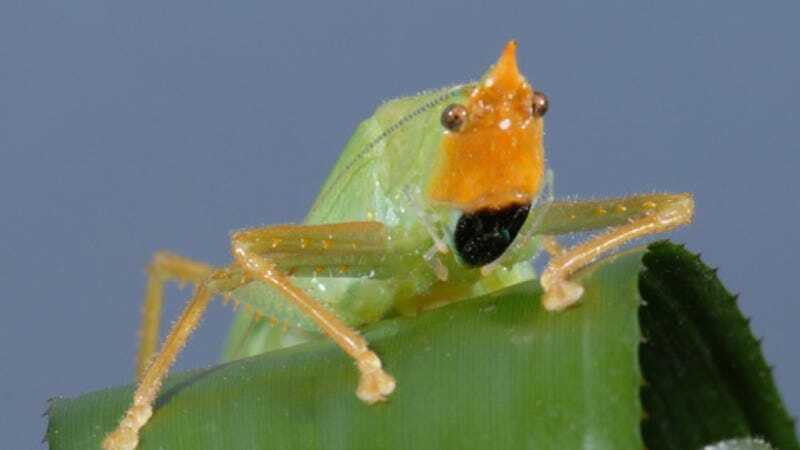 The upshot: the ears on this insect's hind legs — despite being described by Motealegre-Zapata and his colleagues as "among the smallest in all organisms" — mirror the three canonical processing stages of mammalian hearing. That makes them a beautiful example of something biologists call convergent evolution (when anatomically and functionally similar traits arise in unrelated species). Convergent evolution is pretty wild to begin with (just think about it: wings evolved independently in insects, bats and pterosaurs); that katydids have evolved a series of structures similar to those found in mammals to comprise a functionally analogous auditory system — and that these structures reside on the insects' legs — is almost too much awesome for me to handle.